You catch your lover’s heated gaze across the room at a party. What you have to say shouldn’t be overheard, so you take out your cell phone. An intimately worded text could very well lead to an early departure or at least build anticipation for what might occur later in the evening. Today, flirting is as easy as texting. But did you know, two hundred years ago ladies in Regency England had their own way to silently communicate with their suitors? And they also used one of their fashionable accessories to help them flirt. This Regency era fan is made of lace and painted silk. The sticks are made of carved ivory. 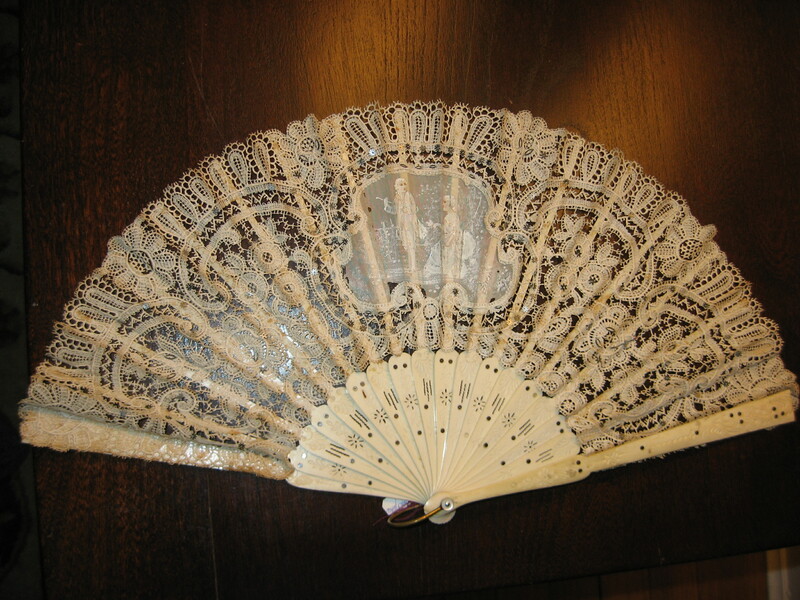 During the Georgian and Regency eras one of the most popular fashion accessories was the fan. Sophisticated ladies also knew their fans came in handy for more than stirring up a cool breeze. When she made a particular gesture with her fan, a lady could send a silent message to a potential or current suitor across a crowded ballroom and remain discreet. This fan language was revealed in etiquette books and magazines of the day. Fanology or Ladies’ Conversation Fan by Charles Francis Badini was published in London in 1797. It outlined a list of gestures and the messages they sent. Carrying a fan in your left hand in front of your face = I want to make your acquaintance. Touching the tip of the fan with your finger = I wish to speak to you. Carrying an open fan in your left hand = Come and talk to me. Carrying it in your right hand in front of your face = Follow me. Placing it by your left ear = Leave me alone. Twirling your fan in your left hand = We are being watched. A half closed fan pressed to your lips = You may kiss me. Twirling your fan in your right hand = I love another. Placing the fan near your heart = I love you. Shutting a fully opened fan very slowly = I promise to marry you. With all these subtle indications a lady would hope her gentleman was also well-versed in fan language. If he wasn’t, it might have led to a very frustrating evening. What might the Duchesse de Berry wear to the ball?